The eight-day long international Minjar Fair of Chamba concluded here amidst the performance of traditional and religious rituals and festivities today. More than one lakh persons hailing from different parts within and outside Himachal Pradesh, including tourists from the neighbouring states participated in the week long historic fair, which is one of the major tribal carnivals of the northwestern Himalayan region. Procession taken out to mark the conclusion of Minjar Fair in Chamba on Sunday. Tension prevailed in the town on the conducting day of the eight-day International Minjar Fair following the alleged beating up of two local youngsters by the personal staff and the Superintendent of Police himself. The fiscally-stressed states like Himachal Pradesh will have to comply with stringent conditions and carry out radical economic reforms in the right earnest to avail the debt mitigation facility. The hill state, which is reeling under a debt of over Rs 18,000 crore, is seeking a soft loan of Rs 7,000 crore to replace its expensive debt under the facility. 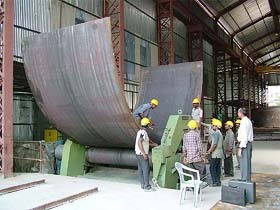 The fabrication work of four penstocks of the biggest diameter as yet in India was started yesterday at Slapper by the Kol Dam Hydroelectric Project authorities. These four penstocks will be part of an 800 MW (200x 4, each penstock will feed a 200 MW turbine) powerhouse which is being constructed by the National Thermal Power Corporation on the border of Mandi and Bilaspur districts on the Sutlej. Lamenting that the prime industrial areas of Baddi-Barotiwala had become a haven for Bangladeshi infiltrators, the state BJP spokesman and local MLA, Dr Rajiv Bindal, yesterday said in the absence of adequate check and proper housing for the industry labourers the area had been reduced to slums. McLeodganj has turned into a haven for those hooked on drugs. The situation has assumed alarming proportions forcing the police to coordinate with the0 Narcotics Control Bureau to take stock of the situation before launching a crackdown in the area. The Himachal police has launched a number of schemes to change the “traditional image” of the men in khaki and instil a sense of security among the people. The emphasis is on public-friendly schemes to help win the confidence of the people in the law and order machinery. Former Union Minister and all-India General Secretary of the BJP Raj Nath Singh today blamed the first Indian Prime Minister, Jawahar Lal Nehru, for the Jammu and Kashmir problem. Had Nehru acted in a tough manner in, 1948 when the Indian forces had entered PoK, the present situation would not have developed, he said. A local builder, Mr O.P. Sahni, was issued a notice yesterday by the electricity department after its team detected unauthorised power connection in his seven-storeyed under construction building located on the Mall road here. The builder had allegedly routed the temporary connection procured from the department to its 25 flats which had been sold off. New plantations will be raised on 25,000 hectares during the current year by the Forest Department. Stating this while presiding over the Vanamahotsava organised by Him Sewa Sangathan here today, Mr Kaul Singh, Irrigation and Public Health Minister, said that last year only 15,000 hectares were covered under the afforestation programme. One person was buried alive and five others were injured, one of them seriously, as their houses were hit by a heavy landslide at Kanda Nala village in the Chogtali gram panchayat under Rajgarh subdivision, about 150 km from here, this evening. A youth was killed and four other were injured when a car (CH-03H-0511) carrying them rolled into 600 feet deep gorge, near Datyar, on the Kalka-Shimla National Highway, 23 km from here, this afternoon. The eight-day long international Minjar Fair of Chamba concluded here amidst the performance of traditional and religious rituals and festivities today. More than one lakh persons hailing from different parts within and outside Himachal Pradesh, including tourists from the neighbouring states participated in the week long historic fair, which is one of the major tribal carnivals of the northwestern Himalayan region. The immersion of golden ‘minjars’ (top blossoms of the maize plant) with coconuts on the banks of the Ravi by the Himachal Pradesh Chief Minister, Mr Virbhadra Singh, who was the chief guest, marked the end of the fair. The festival symbolises the blossoms of the maize crop, which is the main crop and staple diet of people of this mountainous region. People pray to gods and seek blessings for a good harvest. Men, women and children adorn themselves with the sacred gold tassels of ‘minjars’ on their colourful costumes in the fair and pray to rain god Varuna for timely rain and bumper crop. Earlier, a shobha yatra started from the Akhand Chandi Palace, passed through the main bazaar of the town and ended at the right bank of the Ravi for the immersion ceremony. The town’s presiding deity, Lord Raghuvira, was carried in a paranqum accompained by other local deities and the insignias of Lord Manimahesh, Lakshmi Narayan and Charpat Nath. Mr Harsh Mahajan, Animal Husbandry and Urban Development Minister, Mr Thakur Singh Bharmouri, Chief Parliamentary Secretary, Mr Kuldip Pathania, Chairman, Himachal Pradesh Finance Commission, Mr Surinder Bhardwaj, an MLA from Rajnagar and President of the District Congress Committee, Mr Kewal Singh Pathania, state president, National Students Union of India, Mr Puspendra Rajput, Deputy Commissioner of Chamba were among those who took part in the procession. Earlier, the Chief Minister, Mr Virbhadra Singh, who arrived in Chamba by a helicopter dedicated the Rs 3.34 crore newly constructed double-lane Parel bridge, Chamoonu bridge built at the cost of Rs 78 lakh a ten-suite rest house built at the cost of Rs 58 lakh at Chamba and the full fledged hospital building with all OPD and surgical facilities built at the cost of Rs 2.25 crore to the people of the region. According to the office-bearers of the Veopar Mandal, an altercation took place between Baboo Ram, servant of a dyer and drycleaner, and police officials along with the SP over the parking of a scooter in front of their shop. It is alleged that the police officials started beating up the Baboo Ram and when a neighbour, Ayub Khan, came there, he was also thrashed by the police. The news spread in the bazars of the town. All the traders assembled at the main chowk and blocked the traffic. The Chief Minister, Mr Virbhadra Singh, was to cross through this road to dedicate a newly-built hospital building at 12.30 pm, but the shopkeepers stayed with black flags, raising slogans against the SP, Chamba. The Animal Husbandry Minister, Mr Harsh Mahajan, tried to defuse the situation but the agitators stuck to their demand of shifting the SP immediately. They also demanded a probe into the incident. In the meantime, the Chief Minister ordered an inquiry into the incident to be conducted by the Divisional Commissioner. For not ordering the transfer of the SP, the demonstrators gheraoed the Chief Minister. According to sources, the medical examination of the youths who were beaten up was carried out in the district hospital for registering a case at the instance of the Chief Minister. The fiscally-stressed states like Himachal Pradesh will have to comply with stringent conditions and carry out radical economic reforms in the right earnest to avail the debt mitigation facility. The hill state, which is reeling under a debt of over Rs 18,000 crore, is seeking a soft loan of Rs 7,000 crore to replace its expensive debt under the facility. With a state gross domestic product of Rs 19,000 crore the debt liability has to be brought down to Rs 12,000 crore to achieve the normative level. Besides, reducing the revenue deficit in accordance with the provisions of the Fiscal Responsibility and Budget Management Act, the state will have to take a number of steps to bring down the cost of basic services like water, power, health, education and transport. As a first step in this direction the state has been asked to benchmark the reasonable cost of services by taking into account the cost of such services in the private sector. Recovering at least the maintenance and operation cost of services from the consumers is a major objective of the reforms. At present the public sector services are not only plagued by inefficiency but even their cost is also unreasonably high. For instance, the supply cost of water supply to Shimla city comes to Rs 27.50 per kilolitre which is ridiculous. Obviously, the consumers cannot be asked to pay such high charges. At present the Municipal Corporation is charging only Rs 3.80 per kilolitre to the domestic consumers. Hence, the need to benchmark the reasonable cost. A public tariff commission is proposed to be set up for the purpose. At present more than one-third of the state’s budget is being utilised for the repayment of loan and interest. The budget for the current financial year is Rs 7,462 crore and the outgo of Rs 2753.70 crore, including interest to the tune of Rs 1,723 crore, towards debt servicing will be the highest to date. The soft loan in the shape of debt mitigation facility will bring down the amount required for debt servicing almost by Rs 1000 crore. This in turn will help the state to reduce its borrowings. The state will have no option but to pursue economic reforms to avail the facility as Centre has also made it clear that the amount under debt mitigation facility will be released in instalments after evaluating the progress of reforms. The milestones fixed for the purpose will have to be achieved to avail funds. While talking to The Tribune, Mr R.B. Pathak, Assistant General Manager, Kol Dam, said the Kol Dam Project was the first hydroelectric project of the NTPC which had been executing thermal power projects so far. The project work was going ahead of schedule and by the end of the year 2008, electric generation would be started, he added. According to Mr D.S Pandey, Manager (Mechanical) at the Slapper workshop, the work of fabrication of penstocks is important as penstocks of 6.45-metre diameter were being fabricated in India for the first time and the cost of these fabrication of these penstocks would be Rs 70 crore. The total cost of the construction of the power house, inclusive of penstocks, would be Rs 190 crore. The fabrication work was awarded to PES Engineers, Hyderabad, which has got 25 years of experience in the field of fabricating penstocks. At present, this concern is fabricating penstocks for different hydroelectric projects in Himachal Pradesh. According to Mr Parshant, Public Relation officer of the Kol Dam Project, it will take two years to fabricate four steel-lined penstocks which will be used to feed 200 MW generators each and will take the water of the Sutlej from the dam to the power house underground. One important aspect of this workshop is that the BBMB had fabricated six penstocks of 3.35 metres diameter each about three decades back at this place. these penstocks were used in 990 MW Dehar Power House at Slapper. Now the history has repeated itself. Nearly one lakh labour force from Bihar, Uttar Pradesh and Bangladesh was residing there. Besides creating law and order problems, it severely affected the Himachalis living there. Addressing media persons here, he said the state government had failed to protect the interests of the state. The fact that the Central industrial package announced by the former Prime Minister Mr Atal Bihari Vajpayee had been curtailed was an indication that the Chief Minister, Mr Virbhadra Singh, was losing ground at the Centre. Taking a strong exception to the statement of the Punjab Finance Minister, Mr Surinder Singla, about the end of industrial boom in Himachal, he said it was an open challenge to the state government. He said the Punjab Finance Minister’s open invitation to the industrialists to come back to Punjab as Himachal provided no infrastructure facilities indicated the failure of the state government in providing facilities to industrialists. Coming down heavily on the state government, he said not a single paise had been spent on infrastructural development in industrial area which had forced investors to shift to Uttranchal. He said despite having Congress-led governments in the neighbouring Punjab and Haryana as well as at the Centre, the Virbhadra government could not retain the benefit of industrial package. The pressure created by these two states forced the Centre to curtail the excise benefit, he added. He demanded an immediate rollback of a notification permitting 70 per cent intake of contract labour in information technology and biotechnology based industries. Sources in the Police Department told The Tribune that there were inputs from some intelligence agencies about free flow and consumption of narcotics and other psychotropic drugs, especially by foreign tourists in McLeodganj and its surrounding areas of Dharamkot, Naddi and Bhagsunag. “A strategy has been put in place and investigations are on to collect evidence in this regard. The modus operandi of the drug peddlers and the involvement of the locals are also being looked into,” said an official. Instead of focussing on the activities of tourists only, who allegedly come to the area only for the easy availability of drugs, the intelligence agencies are focussing on the larger drug scene. “Since it involves tourists, we do not want to act in haste until we gather enough proof as it could scare away even innocent tourists,” added the official. Even though the Police Department may have woken up to the problem now, the free flow of narcotics is common knowledge in McLeodganj. Mr P.S. Negi, a travel agent, said to be soft on the issue, despite the allegations, only because it involves tourists wasn’t valid as the governments of countries these tourists belonged to would never tolerate Indians getting into drug peddling and consumption on their land. “There has been no major drive to check the consumption of narcotics in the area and this has encouraged addicts from certain countries to converge here. Besides, they are not tourists exactly as they do not spend much, share cheap accommodation and spend only on buying drugs,” said another travel agent. A police official admitted that till now there had been no concerted effort to crackdown on drug peddlers in the area. Most of the addicts put up in small private accommodations rented out by the locals for meagre monthly rentals. “The full-moon parties, organised on the hill top near the waterfall and attended by mostly foreigners and some local Tibetans, is one occasion when one can expect free flow of charas, opium and smack,” said a local youth on condition of anonymity. Mr S.P. Singh, Superintendent of Police, confirmed that the flow of drugs in McLeodganj and its surrounding areas was being probed. “We will definitely take action in case substantial evidence is found,” he said. The Himachal police has launched a number of schemes to change the “traditional image” of the men in khaki and instil a sense of security among the people. The emphasis is on public-friendly schemes to help win the confidence of the people in the law and order machinery. For instance, to avoid delay in the registration of cases and harassment of the public, a “Suvidha Yojna” has been introduced under which a complaint can be lodged at any police station irrespective of jurisdiction. The case is further transferred to the police station concerned for investigation. Up to March 2005, 214 cases were registered in various police stations of the state under this scheme. Similarly, under the “Vishwas Yojna”, introduced in the year 2000, about 98,000 schoolchildren have been taken to police stations to enable them to understand the working of the police. It has helped in instilling confidence amongst children who see the police in a new role of building a good society. The police has also produced a documentary film titled “Aap Aur Hum” to educate schoolchildren. It enlightens people about the functioning of the police personnel at various levels and their rights and responsibilities vis-a-vis the police working. Over 1,000 video cassettes have so far been distributed free of cost. Judo-karate training is also being imparted to school girls to make them capable of self-defence. So far 18,740 girls have been imparted training. The community policing scheme has been introduced to involve people in maintaining law and order. Under the scheme, a police station is divided into sectors corresponding to wards of panchayats and municipal areas. The members of households in a particular sector constitute the people policing committee of that sector. Each sector has an active group consisting of six respectable residents of the locality, one homeguard, one chowkidar and one police constable who acts as its secretary. As many as 117 police Assistance Centres have also been established at important places for the convenience of the people, especially tourists. Addressing a rally organised here today to honour the families of 52 Kargil martyrs of the state. Mr Raj Nath Singh said whatever was achieved by the BJP-led NDA Government in the Kargil war, had been destroyed by the present UPA Government at the Centre. The situation had now reached such a pass that Naxalities and militants had started raising their heads in various parts of India, he said. The delaying policies of the UPA Government and withdrawal of POTA were to be blamed for the present mess, he added. The BJP leader paid rich tributes to the national heroes who had laid down their lives for the nation. He said he was proud to be in Himachal Pradesh which was known as the land of martyrs. Mr Suresh Bharadwaj, MP, and state BJP chief, on this occasion announced the setting up of a huge memorial for the war heroes at Hamirpur. He said all three MPs of the party from state would donate Rs 5 lakh each from their funds and if need be more funds would be provided for the project to salute these heroes. While talking to reporters at the meeting venue, Mr Bhardwaj justified the decision of the party to observe Kargil Day all over India. He said BJP never forgot nation’s heroes and that was why it was observing this function. Mr Prem Kumar Dhumal, former HP Chief Minister, paid tributes to the Kargil heroes and added that the decision of the state government to give them financial help to tune of Rs 5 lakh each was a token amount to rehabilitate them and to stand on their feet. He narrated the Kargil war history and his visit to Kargil peaks during the war. Former Union Minister, Shanta Kumar said a nation that forgets its heroes can not survive. He said Himachali jawans had proved time and again that they were one of best fighters in the world. A local builder, Mr O.P. Sahni, was issued a notice yesterday by the electricity department after its team detected unauthorised power connection in his seven-storeyed under construction building located on the Mall road here. The builder had allegedly routed the temporary connection procured from the department to its 25 flats which had been sold off. This was not just a violation of the power board’s norms but also caused a revenue loss to the board. The team, led by XEN Surender Thakur and SDO Bisheshwar Sharma, descended on the premises of Amit Apartments on Thursday and took notice of the manner in which unauthorised electricity wires had been routed through underground network. The officials estimated the power usage of approximately 450 KW in the entire complex, while officially only a temporary connection had been issued. It was yet to be ascertained as to which official had granted the permission for this temporary connection as a load of 100 KW and above could only be sanctioned by an XEN. The Executive Officer of the Solan Municipal Committee, Mr B.R. Negi, said a no objection certificate was issued to only nine flats. The officials said the builder had paid no heed to an earlier notice issued by the department on July 5. The notice had directed the builder to furnish its project report with the mandatory permission of the Town and Country Planning Department. The notice had directed the builder to furnish detail of the electricity load required by the apartments. Interestingly, the Town and Country Planning Department had shrugged off its onus by replying back that since the building fell in the municipal area they had no role to play and they had not accorded any permission to the building. Taking serious note of this laxity, the officials yesterday directed the builder to furnish this information within two days. The Deputy Commissioner, Mr Rajesh Kumar, has also constituted an inquiry into the construction of the apartments. The report submitted by the SDM had pointed out that the apartments were constructed in violation of the norms. New plantations will be raised on 25,000 hectares during the current year by the Forest Department. Stating this while presiding over the Vanamahotsava organised by Him Sewa Sangathan here today, Mr Kaul Singh, Irrigation and Public Health Minister, said that last year only 15,000 hectares were covered under the afforestation programme. He called upon the non-government organisations (NGOs), mahila and yuvak mandals to supplement the efforts of the government to conserve and protect forests. He said that tourists in large number flocked to Himachal Pradesh to enjoy the greenery, scenic beauty and pollution-free environment of the hills. Green felling had been banned in the state to protect the forest cover. He said at present about 26 per cent area was under forest cover and efforts were afoot to increase it to 65 per cent which could only be possible with the mass participation of people. The minister said that a water policy was being formulated which would ensure that a minimum of 15 per cent water in rivers and other sources would have to be released for the flora and fauna. All hydel power companies and even IPH department would have to abide by it. He said that rainwater harvesting was being made compulsory in all new buildings in urban areas of the state. He said Rs 21 crore was being spent on meeting the water needs of Shimla only. Work on a Rs 40-crore Giri drinking water scheme was in progress and it would be completed over the next two years to help solve the water problem of the city for the next 20 years. Doctor on duty in the Rajgarh subdivisional hospital confirmed that Bira Ram, about 55 years of age, was brought dead to the hospital. The condition of injured Pritam Singh was serious. He was referred to the IGMC, Shimla. Four other injured were being treated for multiple injuries which they received as they were buried under a heavy quantity of mud and debris of their houses. Mr Asha Prakash, president of gram panchayat, Chogtali, who was attending patients in the Rajgarh hospital, said on the telephone that at about 5.30 p.m. Kanda Nala village experienced a heavy landslide which smashed three houses belonging to deceased Bira Ram, who was a supervisor in the Public Works Department under Rajgarh PWD Division. Villagers rushed to rescue the family members of Bira Ram. They saved five out of six buried under mud. He added that critically injured Pritam Singh was a resident of Jailag village and an employee of the HPSEB. He had come to pay a visit to the residence of Bira Ram. The others injured are Kapil Dev (27), a son of Bira Ram, Kiran (24), Sunderi Devi (wife of deceased) and a child, all family members of deceased Bira Ram. The SDM, Rajgarh, Mr Rajeshwar Goyal, along with other officers of Rajgarh subdivision, visited the village to supervise the rescue work. They were on their way back to home from Shimla. The four injured, including two girls, were taken to ESI Hospital, Parwanoo where their condition was stated to be out of danger.